On the last day of my recent Boston trip (which saw meals at L'Espalier and Craigie on Main), I needed a quick, casual place to try before my late afternoon flight back to LAX, and Neptune Oyster fit the bill perfectly. 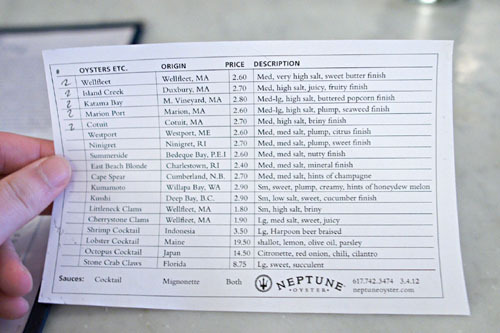 Part New England-style seafood joint, part bistro, and part wine bar, Neptune Oyster is the creation of Jeff Nace, former beverage manager at Olives in nearby Charlestown (Todd English's first restaurant). Nace worked there for 12 years before leaving in 2004 to open Neptune with wife Kelli. A longtime resident of Boston's North End, he'd always had an interest in seafood, and felt that Neptune would be a great change of pace for the largely Italian neighborhood. Nace recruited legendary Colombian shucker Adriana Muneton from Barbara Lynch's B&G Oysters, and installed fellow Olives alum David Nevins as Executive Chef. The CIA-trained Nevins garnered considerable acclaim for his cooking here, but left in 2007 to open Osetra in Norwalk, CT (since closed). He was replaced by Nate Nagy, who lasted until the middle of 2009. Enter the current team of head chef Michael Serpa and his sous, Daniel Karg. About the Chef: At age 13, Serpa began his culinary career at his father's restaurant in Miami, and during his high school years, even worked as a line cook part-time. Serpa skipped college and continued cooking, becoming Sous Chef at Judy's on Cherry in Reading, PA. From there, he attended the Culinary Institute of America, and soon secured an externship at Todd English's Olives in New York. Serpa liked the job so much that he decided to stay on instead of returning to the CIA. This led to a position at Olives in Charlestown, where Serpa stayed for two years before decamping. He ended up doing some catering in Florida, then secured a Sous Chef position at Neptune in July 2008. Following Nate Nagy's departure, he was thus promoted to Executive Chef. The interior, with its white tiles, pressed-tin ceilings, red leather banquettes, and mirrors-turned-menus, is definitely bistro-esque. In terms of capacity, Neptune's not a huge space, with 15 seats at the bar and another 27 at the tables. The restaurant doesn't take reservations, and waits can be excruciating. I'd recommended doing as I did, and come at an off-time. I took a seat at the marble-topped bar, and was quickly handed a list of the day's bivalves, not unlike an oyster version of a sushi menu. Click for a larger version. Seeing as how I was visiting Boston, I made a point to try all of the local Massachusetts varietals. 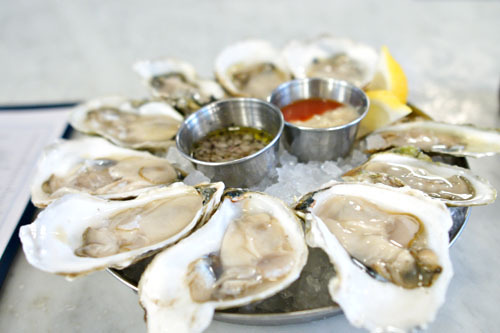 I ordered two of each, one to eat plain, and one to garnish with cocktail sauce and the Prosecco-based mignonette. Wellfleet, Wellfleet, MA, [$2.60]: Meaty in consistency, with a definite salinity countered by an almost as powerful sweetness. Very nice, with a clean, short finish. Island Creek, Duxbury, MA, [$2.70]: Quite briny, with a long, lingering finish awash with the essence of the sea. Katama Bay, Martha's Vineyard, MA, [$2.80]: Also known as Sweet Petites, these were my favorites of the quintet. Wonderfully balanced, with a great interplay of salty, sweet, and buttery flavors. Marion Port, Marion, MA, [$2.60]: These were delicious as well, probably my second favorite of the selection: plump and satisfying, with a crisp, ocean-y finish. Cotuit, Cotuit, MA, [$2.70]: Last up were the Cotuits, which were probably the most delicate of the fivesome, with a very refined mix of saccharine and briny characteristics. All in all, this was arguably the strongest platter of oysters that I'd ever had, with not a dud in the bunch, and no errant bits of shell either. Regular readers will know that I'm usually a fan of West Coast oysters (Kusshis, Kumamotos, Shigokus, and the like), but a spread like this might just turn me around. 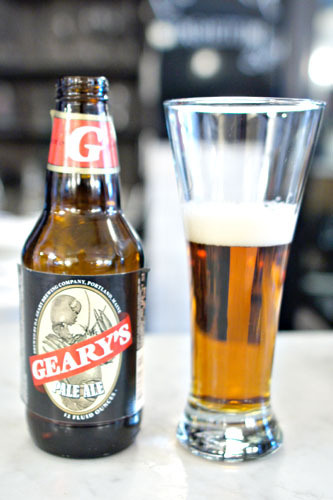 To pair with the oysters, my server recommended a bottle of Geary's Pale Ale [$6.50], a straightforward, but balanced beer with a marked malty flair contrasted by a dry, hoppy character. 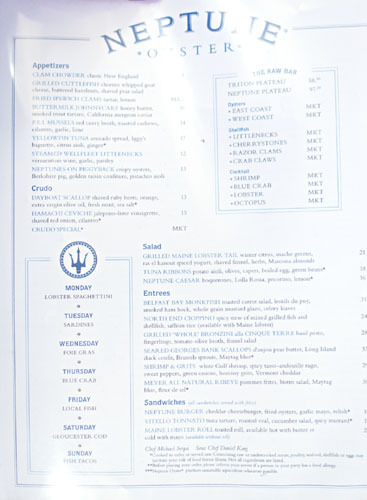 And here we see the rest of Neptune Oyster's menu, featuring an appealing selection of plated and otherwise "cooked" dishes. Click for a larger version. As a starter, I went with Neptune's version of the johnny cake (also known as a hoecake), a sort of cornmeal pancake endemic to the New England area. The dish was a great example of the interplay between sweet and salty flavors, with the sugary, buttery cake playing off the considerable fishiness and brine of the trout-caviar combo nicely. 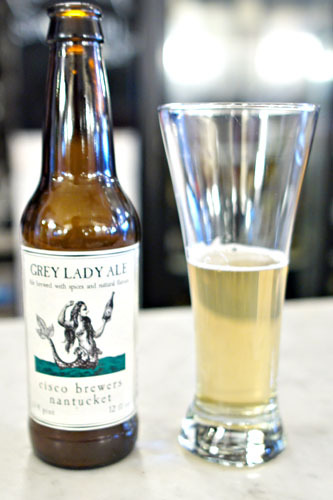 With the Geary's all drunk up, my server brought out the Grey Lady [$7.50] Belgian-style wheat, from Nantucket's Cisco Brewers. This was one of the most interesting beers that I'd had in a while, and I really enjoyed it. Super light in color and body, it showed off a remarkable combination of lemon-y, hoppy, and herbal flavors on the palate, along with an undercurrent of spice and malty caramel. This is one that I may have to seek out. The lobster roll was, of course, the real reason I was at Neptune Oyster. It's their most popular dish (even though Chef Serpa apparently doesn't even care for lobster), and the restaurant serves the roll in two ways. 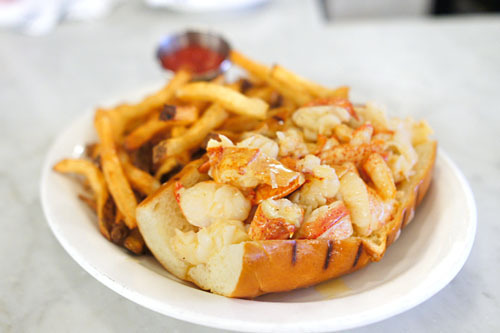 There's the traditional method involving cold lobster bathed in mayonnaise, and also a hot version served with drawn butter (Connecticut style). Though the former is more common, everyone that I spoke to directed me toward the latter, and with good reason. What we had here was a heaping pile of lobster nuggets, sitting atop an almost useless grilled brioche bun from Iggy's. The lobster itself was spot on: snappy and sweet, with an additional heft courtesy of the warm clarified butter. It went swimmingly with the slight sugariness of the bread, whose soft, spongy, butter-soaked consistency formed a fitting foil to the meat. And the hand-cut fries on the side? Superb as well. A real celebration of lobster. 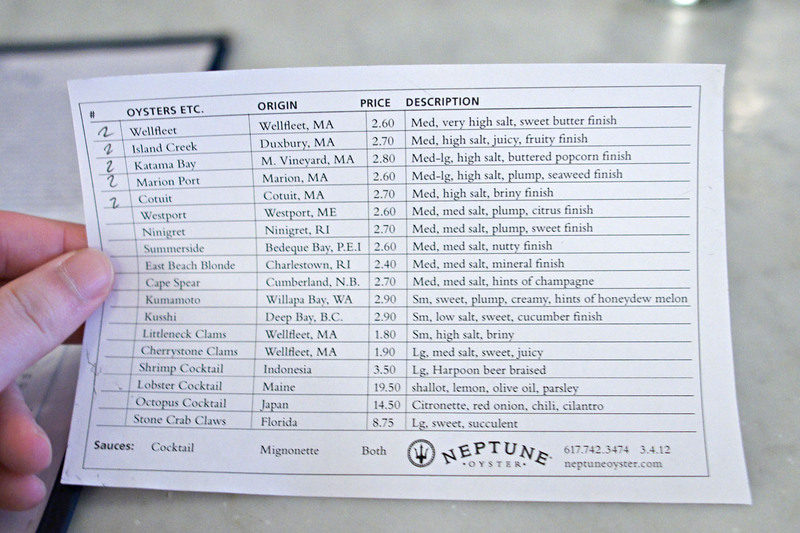 Neptune delivered exactly what it promised: stellar East Coast-style seafood. The oysters were all top notch, and the lobster roll is simply not to be missed (though I am curious about their cold version now). 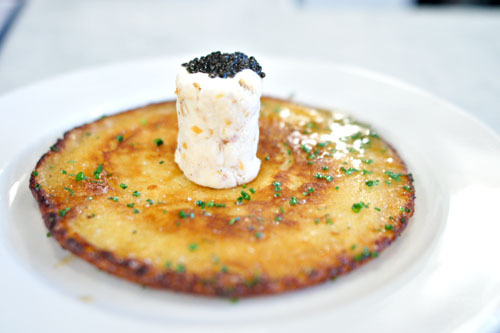 From what I tasted of the Johnnycake, their more "creative" dishes are certainly worth a try as well. In fact, my only regret was that I wish I had more stomach capacity so I could've tasted more of the menu! This is the type of place that I could see myself going back to again and again. Is there even an equivalent in SoCal, or do I have to wait until Michael Cimarusti's Connie & Ted's opens up? Well, there is Blue Plate Oyster Bar in Santa Monica, but probably not the same quality. I would wait for Connie & Ted's. Jen and I tried both the hot and cold at Neptune last month. We thought the hot lobster was a bit more tender and butter was better than the mayo. The cherrystone clams were our favorite. In LA, I've always liked Hungry Cat in Hollywood. Both the peel n' eat shrimp and the other raw shrimp dish. Love Neptune Oysters. Did you dine at any other places in Boston? Anon: Agreed. I've not heard great things about Blue Plate. C&T's just might be the most exciting opening of the year. Waleed: You know, I wasn't that into Hungry Cat. I wanted to love it, but it just sort of feel flat. Perhaps I ordered the wrong things. The peel n' eat shrimp were pretty spectacular though, if I recall. 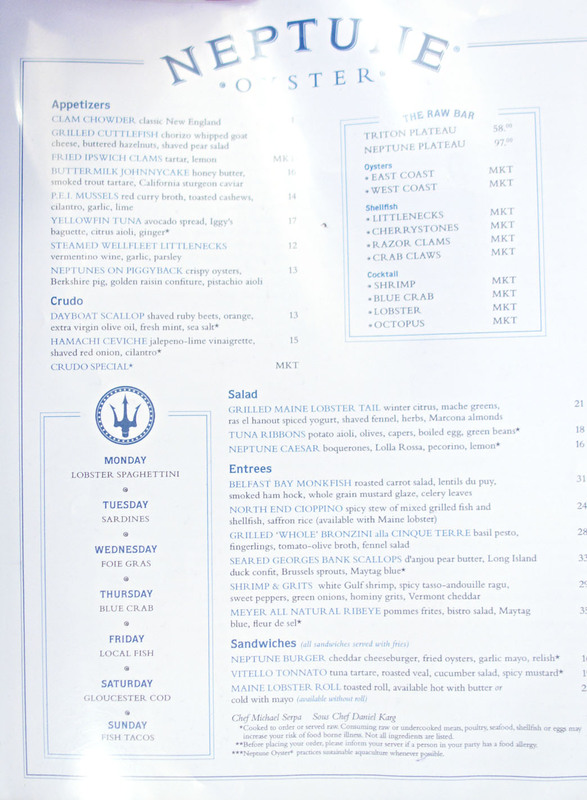 I'm curious about their lobster roll, too.